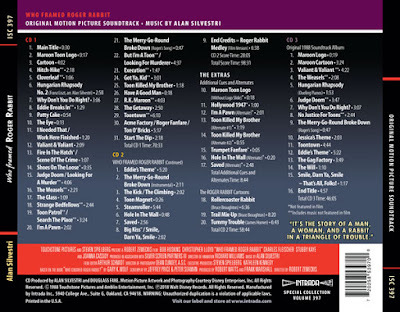 This new set from Intrada features music by by Alan Silvestri and includes unreleased and alternate versions of music composed for the film. As an added feature you'll also get the original 1988 soundtrack. Though by different composers, music from the Roger Rabbit cartoon shorts (Tummy Trouble, Roller Coaster Rabbit, Trail Mix-Up) are also part of the set and have never been released before. "Intrada 3-CD release presents both premiere of complete cue sans dialog on CD 1, original album version on CD 3. Mammoth Silvestri score itself runs nearly 100 minutes across discs 1 & 2, with numerous alternates following on CD 2. Film is scored wall-to-wall with literal smash-up of original score, music bits, songs. Interestingly, the majority of original Silvestri cues are heavily truncated in the film. Intrada release premieres them in their full-length versions as originally recorded by the composer." 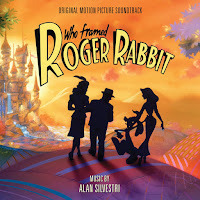 This release marks the first time a full and complete soundtrack of the film has been officially available. The whole set is $34.99 and is at a limited quantity. Order yours today by visiting Inrada's Website.